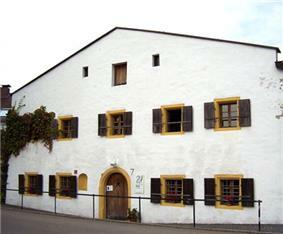 Spur Museum in Cham, Germany. Gruppe SPUR was an artistic collaboration formed by the German painters Heimrad Prem, Helmut Sturm and Hans-Peter Zimmer and the sculptor Lothar Fischer in 1957. They published a journal of the same name Spur. They were the first German artistic group in decades to manifest a freedom of investigation with international relevance, recognized as an equal by the cultural avant-garde of several different countries, pursuing real artistic experiments of their time. By contrast, the German cultural landscape of then was characterized by a total cultural void and by "the dullest conformism, in which the artists and intellectuals being honored were only retarded and timid imitators of imported, old ideas." For this, and possibly other criticisms, the Spur journal was subject to police and judicial prosecutions, and was convicted "in the name of moral order", in order to make the Spur group, and all those who wish to pursue the same route, succumb to the ambient conformism. The Spur group joined and collaborated with the Situationist International, a restricted group of international revolutionaries, between 1959 and 1961. After a series of core divergences during 1960-1, the Spur members were officially excluded from the SI on February 10, 1962. The events that led to the exclusion were: during the Fourth SI Conference in London (December 1960), in a discussion about the political nature of the SI, Spur group disagreed with the core situationist stance of counting on a revolutionary proletariat; the accusation that their activities were based on a "systematic misunderstanding of situationist theses"; the fact that at least one Spur member, Lothar Fischer, and possibly the rest of the group, were not actually understanding and/or agreeing with the situationist ideas, but were just using the SI to get success in the art market. the betrayal of a common agreement on the Spur and SI publications. The exclusion was the recognition that the Spur group's "principles, methods and goals" were significantly in contrast with those of the SI. This split however was not a declaration of hostilities, as in other cases of SI exclusions. A few months after the exclusion, in the context of Judicial prosecution against the group by the German state, Debord expressed his esteem to the Spur group, calling it the only significant artistic group in Germany since WW2, and at the level of the avant-gardes in other countries. The SPUR-artists met first at the Academy of Fine Arts Munich in Munich, Germany. They formed the group in 1957, which lasted until 1965. Guy Debord remarked that while between 1920-1933 "Germany incontestably had the highest rank in the elaboration of art and, more generally, the culture of our era", from the post-war era to 1960, "Germany has been characterized by a total cultural void and by the dullest conformism". The Spur journal was a flourishing exception to such void and conformism, as it was, for the first time in decades, an artistic group that manifested a certain freedom of investigation, and as an "extremely worrisome symptom", this group was almost immediately the object of police and juridical persecutions. The Spur group collaborated with the Guy Debord expressed esteem to Spur, considering it the highest expression of German art and culture of post WW2. However, after the exclusion and split, the two groups remained distinct and separated, and each was only responsible for its own autonomous actions. The first contact with the Situationist International happened through Asger Jorn. Jorn, one of the most prominent members of the SI, discovered the SPUR-paintings at a gallery managed by art dealer Otto Van de Loo. Later on, the Spur members come to join and became members of the Situationist International, forming the majority of the members of the German section of the SI. Despite Spur agreement to add Attila Kotányi and Jacqueline de Jong to editorial committee of Spur, the following issue #7 was printed five months later without Kotányi and de Jong’s knowledge. The issue #7 featured considerable divergences with the SI ideas, marking a distinct regression from the preceding #5 and #6 issues. These events led the following month, February 1962, to the exclusion from the SI of those responsible. ^ a b c d e The Exclusion of the Spurists, Internationale Situationniste #8, 1963. ^ The Counter-Situationist Campaign in Various Countries, Internationale Situationniste #8, 1963.